550kg Knott Avonride standard trailer suspension units. 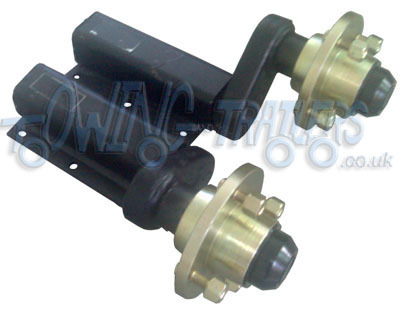 Navigation - Towing and trailers Ltd for Trailer parts : Trailer parts : Trailer Suspension Units : Unbraked suspension units with hubs : 550kg Knott Avonride standard trailer suspension units. A Pair of Avon ride unbraked Suspension units with 4" PCD hubs. These have a standard length Stub axle. These units are suitable for centre nave wheels and are not suitable for using with a flotation wheel or a wheel with an offset as the stub axle will not allow the wheel to clear the side of the trailer. If you require a unit suitable for flotation wheels or wheels with an offset please see extended units. These come with bearings split pins and washers but are not assembled. For technical specification please see diagrams below. Please note all dimensions are measured and there could be slight discrepancies. Please note all weight ratings are as a pair and they are only sold as pairs. If you have a multi axle trailer do not mix suspension units as different manufactures have different ride heights and travel. This may cause axles to be overloaded. To calculate the postage you would be paying for your item/s we have pages that give postage price for your area in weight bands. these can be found using the links below. For more suspension and parts use the links listed below.